About Water Specialties Group, Inc.
Water Specialties Group, Inc., a/k/a Engineering Specialties, was founded in 1994 and is a leader on solving challenging water problems for residential, commercial and industrial applications. We offer superior products and unparalleled expertise as we strive to base our efforts on integrity, scientific principles, and service after the sale. We take the approach that each water source will have unique water chemistry, and our recommendations are science-based and reflect an understanding of water chemistry and applicable, cost-effective technologies. Our company maintains its own laboratory and engineering capability and continues to do extensive research and development. We provide a healthy, solid, long-term approach that is cost effective. Once the installation is completed, one of our experienced team members performs a complete follow-up and training to each of our customers. WSG has very proactive service, maintenance, and delivery programs, as well as, 24/7 technical support. Our goals are to educate our customers about their water with advanced expertise and professionalism in our industry. 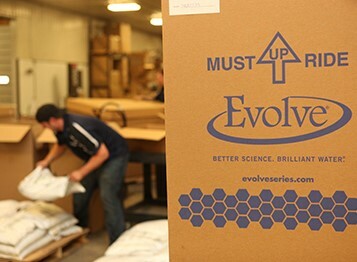 Evolve Series is a trusted name dedicated to advancing the science and art of innovative water treatment solutions. With Evolve Series, innovative water treatment means providing more efficient water so you can have a more efficient home, with longer lifespans for your appliances, plumbing, and fixtures, while also assuring better health for your family. Backed by over 50 years of manufacturing expertise, Evolve Series's water treatment systems will fulfill your family's needs with the highest level of efficiency and versatility. After all, better science makes brilliant water.